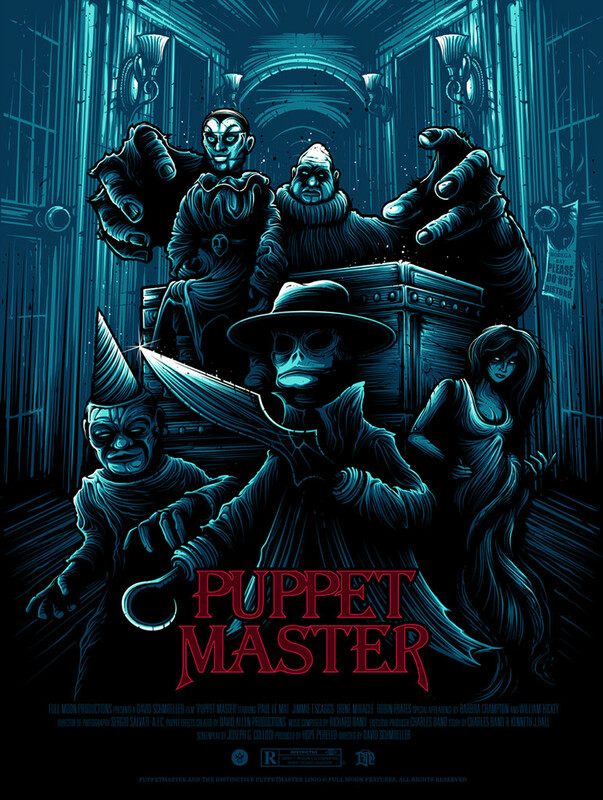 Grey Matter Art under license from Full Moon Features is proud to present a new officially licensed, limited edition screen printed poster by artist, Dan Mumford, for the cult horror film, “Puppet Master”. This will be the first officially licensed poster for Director Charles Band’s iconic franchise, which was originally released in 1989, and has since spawned 10 films. It is an 18″ x 24″ Screenprint, limited edition of 160, and cost $45. On sale Tuesday, February 24th at 1pm Eastern (10am PST) HERE. “Puppet Master is a film that always intrigued me in my youth. It was one of the many films that I would always ask my dad to rent from the video store, but would of course not be allowed to. So much like many of the other fantastic horror movies of the 80’s, its myth and mystique grew even more fascinating to me, and I would pore over the covers and try and imagine what I could from the details on the back of the box. Coupled with the fact that any puppet or toy becoming murderous is absolutely terrifying to a child, it became a film of much reverence to me. Which is strange considering I never actually watched it until I was well into my twenties. This entry was posted in Movie Posters and tagged Dan Mumford, Puppet Master by admin. Bookmark the permalink.